Add a healthy pop of color to any dish. Microgreens are so hot right now. They are nutrient dense, taste great, and add a fresh pop of green to any meal. Sunflower microgreens are at the top of many peoples list, including local farmers Zach and Molly Smith. The Smith’s own and operate Urban Goat Greens, a small family run farm located in East Texas. The farm originated three years ago when Zach realized that he needed a change. “I was sick of eating boring salads. I knew there were better options out there that not only tasted good but were good for you.” Their selection of microgreens consist of pea tendrils, Red Arrow radish, and sunflower. They recently began small batching their own Italian salad dressing and selling it along with their greens. The dressing is made from all organic ingredients including EVOO, balsamic vinegar, oregano, parsley, basil, and thyme. 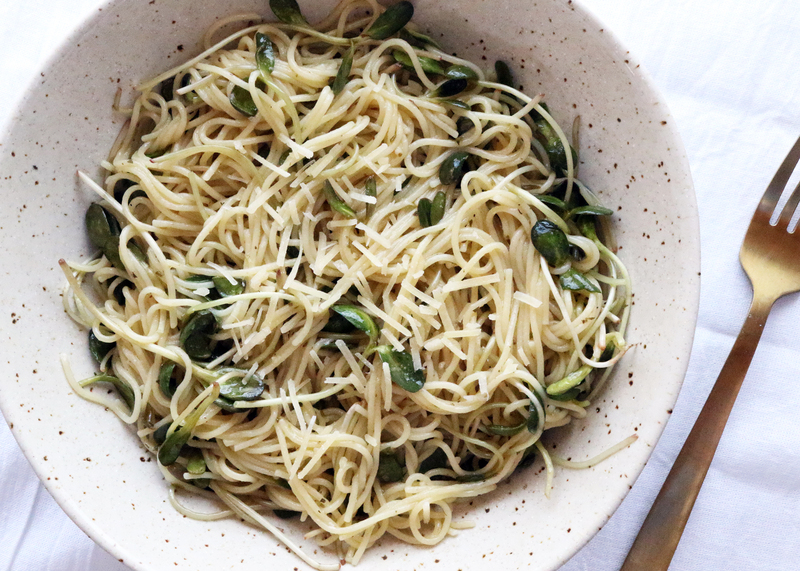 Molly shared one of her favorite sunflower microgreen recipes with me and it will for sure be a staple in my house from now on. Simply take half the amount of pasta you would normally cook and bring it to a boil. After draining, add a bag or two of sunflower microgreens and toss together. The residual heat from the pasta will cook the sunflower perfectly. Add in their Italian salad dressing, toss again, then sprinkle with fresh parmesan cheese. Sunflower microgreens have roughly 18% protein by weight. They contain high levels of antioxidants which is said to aid in heart health, slow aging, and help cellular recovery. They are incredibly versatile and have a nutty sweetness, which makes the greens a great addition to a variety of dishes. You can find Urban Goat Greens at the Rockwall Farmers Market through the end of this month and then on Wednesday afternoons at the Casa Linda market in Dallas, and Saturdays in Irving. Visit their website to learn more.